Thanksgiving was a wonderful time with family and included the best stuffing a vegetarian, vegan or carnivore could imagine. My mom makes it every year. She puts cornbread, toasted pine nuts and fresh sage... oh so glad we have leftovers. This year my dad, sister and I, each had separate conversations with my mom about making sure there would be enough leftovers. My mom insisted we would have plenty. We all cracked up about it when we realized we were all so concerned. I guess you would have to taste this stuffing to understand. It's just that good. We're both relieved it's over though. Now back to normal life. Cleaning. Going through recipes and magazines. Watching Christmas movies. Practicing for the Christmas choir. Christmas shopping... and back in the kitchen again. This time I made a pasta recipe from Rachel Ray's magazine. With leftover baby spinach in the fridge, broccoli, and random pasta in the cabinet, the dinner menu was starting to come together. Now to alter this recipe a tad..
Bring a large pot of water to a boil, salt it, add the pasta and cook until al dente. Drain, reserving a ladleful of the cooking water. While the pasta is working, in a deep skillet, heat the EVOO, 4 turns of the pan, over medium heat. Add the onion, garlic and crushed red pepper and cook for 5 minutes. Stir in the vinegar, then the tomatoes. Season to taste with salt and black pepper and simmer over low heat for 10 minutes. Add the pasta and reserved pasta cooking water to the skillet and toss for 1 minute. Add the cheese, then toss in the arugula and cook until wilted, 1 minute longer. Serve! I served this dish with roasted broccoli I had tossed with walnut oil, cracked black pepper, garlic and Maldon Sea Salt Flakes I got when I was in London. The pasta was really tasty...basically a marinara sauce with a kick from the red pepper flakes. I hope your thanksgiving's were filled with good memories and delightful food to pass around the table. Anyone have any memories to share? One of my favorite dishes is thai curry. But honestly almost anything "curry" appeals to me. I lived in Tulsa, OK for a couple years and would go to this neat little place for red curry with tofu and veggies. It was the best. My sister is the one who introduced me to this new world. I can't seem to make it quite like they do. I wish someone would teach me. So meanwhile I keep trying different recipes. My mom claims she's not fond of curry, yet has enjoyed most of the recipes I've made that include it. Haha! This particular dish sounded so good to me. I've had it pulled aside to make soon for quite some time. We really loved this recipe. I actually got it from Whole Living Magazine... which I have recently been introduced to. Great magazine! Heat a 4-qt. heavy-bottomed pot over medium heat. Toast coriander, fennel, and mustard seeds until fragrant, about 1 minute. Transfer to a spice grinder and process until finely ground (You can also crush the seeds with a mortar and pestle). Heat oil in the pot. 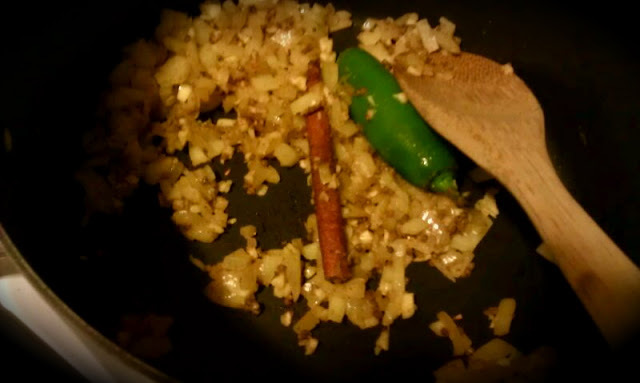 Add ground seeds, cinnamon stick, chili, garlic, onion, ginger, and curry leaves (if using). Cook, stirring occasionally, until onions are soft, 6-8 minutes. Add tomatoes and bring to a boil, then simmer, stirring occasionally, until slightly thickened, about 15 minutes. 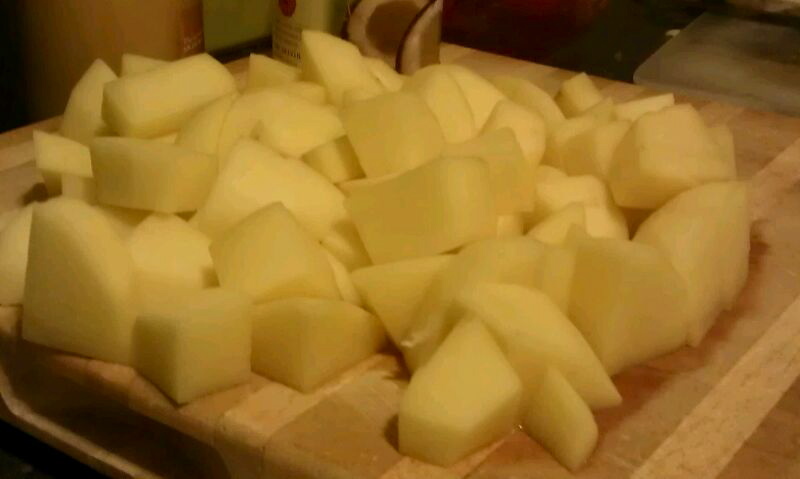 Add potatoes and 2 cups of water. Simmer, partially covered, until potatoes are tender, about 35 minutes. Add peas and cook until tender, about 12 minutes. Season with salt. Stir in yogurt. Remove cinnamon stick before serving. When I cook I almost always use what I have on hand instead of following the recipe exactly. The original recipe said to use the side of a chef's knife to crush the seeds if you're not using a spice grinder. I tried that... huge mistake! The mustard seeds rolled all over the counter. So i changed that in the recipe. Next time I'll use a mortar and pestle. I didn't think of it at the time so I used the whole seeds. Also if I had basil I would have added that instead of the curry leaves and probably still would have added curry powder. It would be a fun recipe to play around with. It was so good! 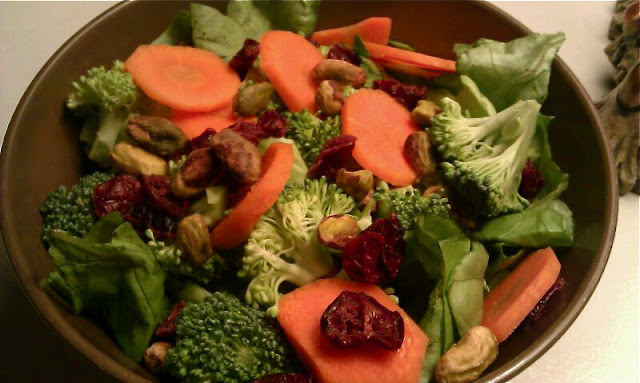 I served this with a salad topped with dried cranberries, toasted pepitas, carrot slices, broccoli pieces, and the vinaigrette from a previous post. But this time I used walnut oil. It really hit the spot! I'm looking forward to making dinner this weekend... more to come. I will be having a house concert December 16th. The Vespers are playing!! If you would be interested in coming, send me an email and I will send you the information! There will be delicious finger foods and cozy drinks to warm you up along with festive-Christmasy fun! 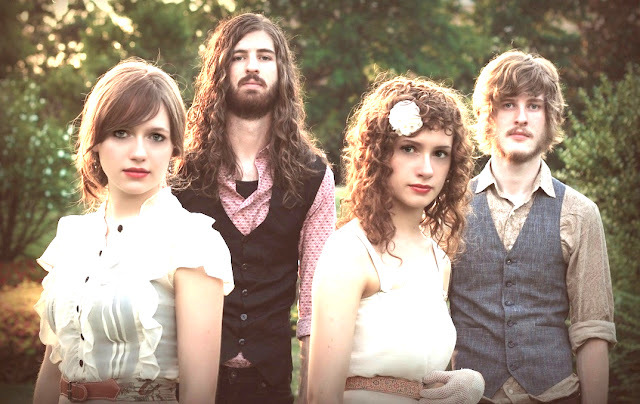 Check out their music whether or not you can make it anyway! You can download some of their music for free here! Sometimes I'm just amazed at the endless possibilities in cooking. Just thinking about all the herbs, vegetables, grains, fruits and spices I have never even heard of all over the world and the combinations you can come up with... wow! What an amazing and creative God! This is one of those rare recipes I have tried that is just bursting with flavor and texture. It's got sweetness from the squash, earthy and savory spices from the vegetables and rice and the tart cranberry sauce is a perfect addition. This recipe was fun to put together and really impressive to serve to others. 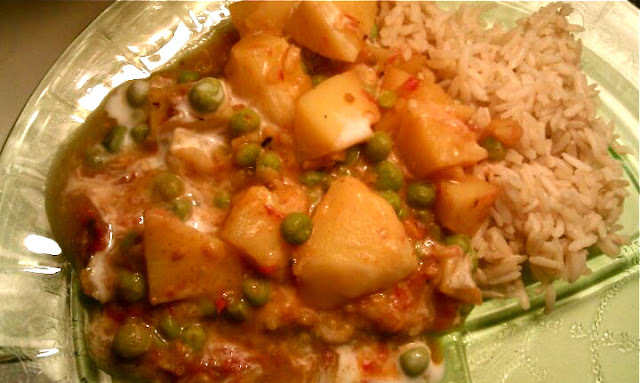 This recipe is from Vegetarian Times magazine. I served it with bread and butter. To make Acorn Squash: Preheat oven 350°F. Coat baking sheet with cooking spray or line with parchment paper. Whisk together olive oil, maple syrup, soy sauce, cinnamon, and 2 Tbs. water in small bowl. Brush inside and edges of acorn squash wedges; place on prepared baking sheet. Bake 30 to 40 minutes, or until squash is soft enough to prick with tip of knife. Keep warm. To make Basmati and Wild Rice: Toast pine nuts in small skillet over medium-low heat 3 to 5 minutes, or until browned and fragrant, shaking pan often. Set aside. Cook rice according to package directions. Set aside. Heat olive oil in large skillet over medium heat. Sauté onion and garlic in olive oil 3 to 5 minutes, or until soft. Stir in rice and pine nuts, and season with salt and pepper. Keep warm. To make Braised Vegetables: Heat olive oil in Dutch oven or large saucepan over medium heat. Sauté fennel in oil 10 minutes, or until softened. Add carrots, and sauté 5 minutes more, or until carrots begin to brown. Add 2 cups water, cover, and steam vegetables 10 to 15 minutes, or until soft. Add snap peas, and steam 2 to 3 minutes more. Season with salt and pepper, and stir in capers. To serve: Place 1 Acorn Squash wedge on each plate. Spoon Basmati and Wild Rice into center of each squash quarter, and top with Braised Vegetables. Sprinkle with chopped parsley, and add a dollop of cranberry sauce, if desired. A few changes that I made: well first of all I used a different kind of squash. I looked at this website and still can't figure out which one I used haha. But Acorn would be amazing as well. For the rice I actually used an Archer Farms "wild rice" and mixed it with short grain brown rice. Instead of fennel I used turnips and parsnips. I also used regular carrots and cut all the vegetables in sticks. I used edamame instead of sugar snap peas and I omitted capers because I don't like them. I encourage you to make the recipe yours. Be creative! Also I served each plate with a generous portion of cranberry sauce since we are all quite fond of it! I sure can't wait to start cooking with some Christmas tunes. I'm ready! 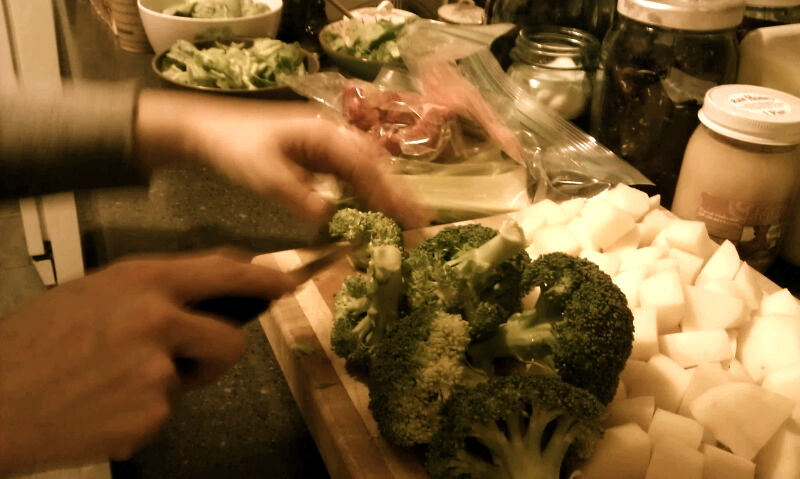 It was one of those rare nights where my sister and I were in the kitchen together. When we were little we used to occasionally make a surprise dinner for my parents. My mom says one of our specialties were sauced meatballs. Haha. My sister and I were very close. We were always doing something silly together: calling 800 numbers to get free stuff in the mail, dressing up in mom's clothes, making home videos, running a pretend video store called "Express the Video" (later known as "Carmen's Videos"), and we even put on shows for our parents. We would hand them a bulletin we had made and we'd sing and dance our hearts out. This particular night didn't include singing or dancing but it included a killer salad my sister threw together while I prepared the pasta: roasted vegetables with bow ties and toasted pepitas and of course my usual garlic bread. Here's the recipe for my sister's amazing salad. The dressing is from a friend of my moms. Assemble salad in order, ending with toasted walnuts. Serve salad with dressing on the side. Be aware that the salad is very sweet with a little tang. We all absolutely enjoyed it though. So if you aren't big on sweetness, adjust as needed. The pasta was super easy to make. I roasted random veggies we had with a little olive oil, garlic, sea salt and freshly cracked pepper. I baked it at 375°F for about 25 minutes or until lightly caramelized and tender, stirring halfway through. Meanwhile in a small pan I toasted a handful of pepitas for a few minutes, until fragrant and toasty. I cooked whole wheat bow tie pasta according to package directions until al dente and threw it in a big bowl. Then I topped the pasta with the veggies, pepitas and a squeeze of lemon. For fun I made an appetizer I had been wanting to make for a while. You peel a sweet potato and slice it in large "coins." Toss with olive oil, salt and pepper and bake until tender. Top with a dollop of sour cream and dill. It wasn't as good as I had hoped. My sister said if I hadn't used vegan sour cream it might have been better. I assume it could be adjusted... i really like the idea. I've seen recipes where you use a regular russet potato, maybe that would be better. Anyone have any suggestions? Even though I really enjoy a good cup of french press coffee at home and my fancy coffee shop drinks, there is something about a "crappy" cup of good old-fashioned diner coffee. Depending on where you are, it can be quite delicious. Like I mentioned before, The Coffeepot is one of my favorite places. They have delicious oatmeal, homemade toast, and american fries. Plus they have bottles of the best hot sauce, Sriracha, on the tables. The wait staff and owners treat you like you are at home. It's wonderful. So there are some recipes I almost dread trying to make vegan in fear that they will not turn out right. There are so many family recipes, especially desserts that I haven't even attempted yet. I know my sister and mom have ran into some funky brownie problems when they replaced the eggs with Ener-G egg replacer. Such a bummer when that happens. A gratin is obviously known for its dairy.. the cheesy, creamy filling... but this recipe managed to come out quite tasty. Preheat oven 400°F. Grease an 11x7" ceramic or glass gratin dish with cooking spray. Sprinkle bottom with 1/4 C. panko. Combine rosemary, salt and pepper in a small bowl. Arrange half of the squash slices in baking dish; sprinkle with half of the rosemary mixture. Spread leeks over squash; top with remaining squash. Gently pour broth over squash; sprinkle with remaining rosemary mixture. Cover with foil sprayed with cooking spray. Bake 35-40 minutes or until squash is almost tender. Sprinkle gratin with nutritional yeast (or cheese of choice). Combine remaining 1/4 C. panko and butter; sprinkle over cheese. Bake, uncovered, 15-20 minutes or until squash is tender and top is golden brown. I actually served this along with the G.I. Joes. It would make a great side dish on Thanksgiving! I got the original recipe from Cooking Pleasures magazine.